For the first time in Egypt, a sanitary landfill was established in Damietta, according to a statement by the governorate. The issue of cleanliness is the most important file affecting the lives of Damietta citizens, said Ahmed Abdel Monsef al-Far, head of the Damietta City local unit, in a press statement on Wednesday. The governorate is of an industrial nature, thus it produces garbage and waste at high quantities every day, Far mentioned, pointing out that it required creative solutions to get rid of garbage. Garbage is buried in garbage bins under the ground that are then lifted and transferred in vehicles to recycling plants, according to Far. He added that the idea of collecting garbage underground will reduce the accumulation of garbage on the streets. Damietta Governor Manal Mikhael praised the idea and ordered the establishment of more sanitary landfills, especially near schools and hospitals, Far said. Mikhael told Al-Masry Al-Youm that since her appointment as governor she received numerous complaints about the aggravation of the area’s hygiene and garbage crisis and the inability of the executive authorities to address it. She added that previous governors tried to address the crisis but it required nontraditional solutions. It also requires raising awareness among citizens of the importance of dumping garbage in their designated places, she added. 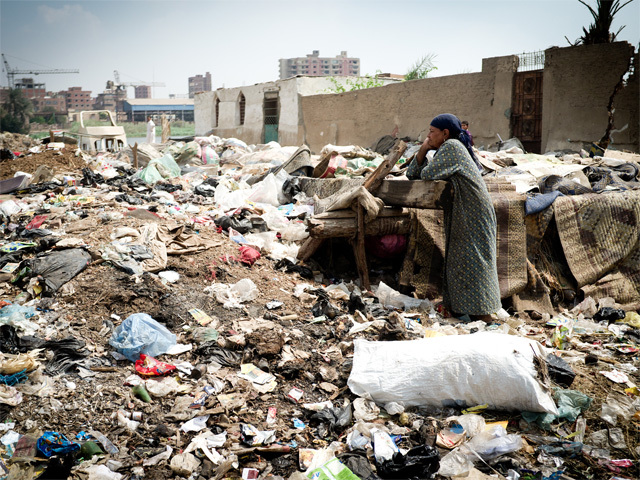 Tarek Kiwan, the sanitary landfill project’s executor, told Al-Masry Al-Youm that the site of the landfill was chosen in a densely populated area that required a central place for garbage collection. The project cost about LE 50,000. A hole was drilled, concrete was installed, and then the landfill was placed in a way that allows it to be automatically lifted onto vehicles that then transfer the garbage to recycling plants, according to Kiwan.